What’s my favorite summer ever? 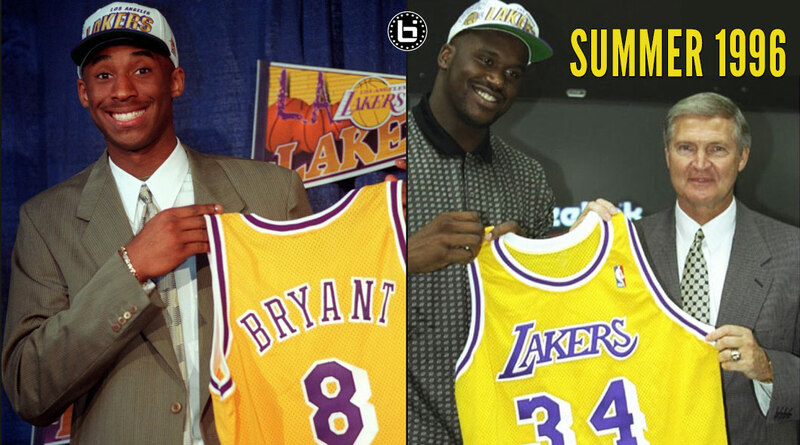 I have some very fond summer memories full of vacations, firsts and events, but as a Shaq and Lakers fanatic in the 90s, I’m going to have to go with the summer of 1996 and I think the Lakers organization will agree with me. On June 26 of 1996, the Lakers traded flop-master Vlade Divac to the Charlotte Hornets for their 13th pick in the NBA draft, which was used on 18-year old Kobe Bryant. Drafting arguably the greatest player to ever wear a prestigious Lakers uniform is probably enough to call the summer their best ever but Jerry West wasn’t even close to being done. They used their 24th pick to draft the fairly unknown Derek Fisher, who would play a giant role as a defensive stopper, leader and clutch playmaker during two stints with the franchise. Then less than a month later, on July 18th of 1996, West worked his magic (no pun intended) on a frustrated Shaquille O’Neal and was able to steal the underrated (yes, he was underrated in Orlando!) 24-year old center from the Orlando Magic with a 7-year, $120 million deal. “This is an incredibly exciting day for the Los Angeles Lakers,” Executive Vice President Jerry West said during The Original Decision on TV. “I can’t tell you how excited Southern California is today. I called our office a little while ago and the response from bringing Shaquille O’Neal to the Los Angeles Lakers has been one that’s unprecedented in our history. . . . So within one month, the Lakers were able to acquire a guard many consider to be one of the five best players ever, a center many consider to be the most dominant ever and one of the top 5-10 best players ever and a cherry on top in the form of Derek Fisher. And if all of that wasn’t enough to make the 1996-97 season a memorable one, the Lakers got a late Christmas present when they traded Cedric Ceballos for disgruntled, towel-throwing Robert Horry on January 10th of 97. I don’t think I have to mention what Big Shot Bob meant to the Lakers dynasty. 10-11-1996. Lakers 1st preseason game. The first official appearance by Shaq and Kobe (in uniform on the bench) as Lakers. Also, the debut of Derek Fisher.